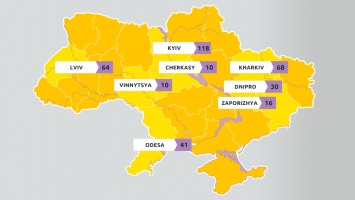 Why do US companies choose Ukraine over India, China, and Latin American Countries for offshore software development? Alyona Pershykova has been with Daxx for more than five years. She has an extensive experience connecting US companies with Ukrainian tech talent. In this interview, she explains what makes American companies consider outsourcing, describes the process of building software development teams in Ukraine, and shares best practices for remote work with offshore developers. Q: You are in the US quite often. What does your business schedule look like when you are there? I’m in the US about once per quarter. We usually agree on meeting times with companies beforehand, and then I just stop by their offices. Meetings normally last for about an hour — I tell the company representatives about who we are and what we do, and we discuss possible collaboration models. Q: How many clients does Daxx have in the US? Currently, we have 26 clients from all over the US (out of approximately 90 clients in total). Q: During your 5 year-long employment at Daxx, have you noticed any patterns in terms of the industries your US clients typically represent? We aren't focused on any type of industry or company size, so we work with very different companies. The list of our US clients includes agencies, healthcare companies, financial companies, logistics, the travel industry, e-learning, security, game companies, and many more. Q: What about the sizes of the US companies you usually work with? Company sizes differ as well: most of our clients are small and medium-sized businesses. They usually select Daxx over other providers in Ukraine because we are an established company, and they feel comfortable with our processes and work model. Daxx currently has 250 employees, and we are at the stage where we are flexible and able to pay attention to each client, but at the same time we are mature and big enough to be considered a reliable and experienced service provider. Q: What makes American companies consider outsourcing software development? Our partners outsource because of a number of factors. The American market is good for hiring tech personnel, and it doesn't really lack talent in the same way Europe does. However, the salary levels in the US are quite high. When it comes to hiring senior professionals in the States, prices can go up significantly. Other factors include administrative and legal issues. What we do is help our clients build their own offshore development team, and take care of all the back-office hassle so they don’t have to deal it them here in Ukraine. The cost of infrastructure and local support staff is much cheaper in Ukraine than it is in the US, which is another cost-cutter in addition to salaries. The most important factor is flexibility: we work with a one-month notice period, which means our clients can scale their teams up and down quickly, adjusting the team composition to their current needs. Q: Why do companies choose Ukraine over India, China and Latin American countries as an offshore location? I believe that every seller finds their buyer. Latin American countries offer geographical proximity and minimal time difference, while India and China offer significant cost reduction and speed, sometimes compromising on quality. What Ukraine has to offer is a unique combination of quality and price. The average salary in Ukraine is higher than it is in Asia but lower than it is in Latin American countries. We don't promote ourselves as a cheap solution, but when it comes to quality, Ukraine is a happy medium for most. Cultural differences also matter, so it's up to our clients to decide. Q: How do your clients usually handle the time difference between the US and Ukraine? There is a 7 to 10-hour time difference depending on the state. Most of our clients follow the Agile/Scrum methodology, and they organize their work with remote developers in such a manner that all the important meetings are held during the morning hours in the US. Also, many software developers don't mind staying online during their non-working hours to accept urgent calls if needed. Usually, they don’t consider this to be overtime. Q: What are the differences between American and Ukrainian developers? There aren’t many, especially in terms of culture. Of course, we deal with different people and personalities, but an average Ukrainian developer is easy-going, responsible, and eager to learn. When it comes to English, Ukrainians obviously have different levels of language skills. Senior and mid-senior developers, however, are likely to have very good English. 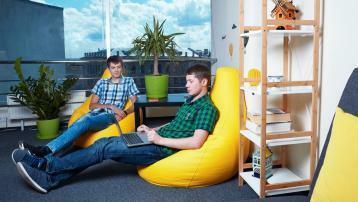 I frequently hear that Ukrainians are more open-minded and creative in their work than an average American programmer. They think outside the box — which isn't too common in tech-related industries. Q: How easy or difficult is it for a US company to get started with an offshore development team? Getting started is surprisingly easy within our model. We just ask the client to provide us with their requirements, discuss all the details over the phone, open the vacancy, and then start screening candidates. Q: What is the average team size and contract length? The average team size at Daxx is three to four developers. This number differs largely between our clients though: there are many cases where clients hire only one developer, but there are also teams with more than 30 engineers. Everything depends on the client’s needs. Our average contract length is a year and a half. Q: Daxx markets itself as a long-term solution. How do you make sure that developers won't just unexpectedly disappear? Retention is definitely one of our key services. It starts at the early interview stage. It's extremely important to set the right expectations to make sure that both the client and the software developer are on the same page in terms of the technologies being used, business needs and vision, career plans, and many other factors. Later, during the work process, we also help monitor the progress of our developers by carrying out regular evaluation interviews. We try to foster a family culture in our Ukrainian offices, as developers spend a huge part of their life here (40 hours per week). At the same time, we encourage clients to think of their Ukrainian developers as a remote extension of their in-house team, and we promote the same ethic among our own personnel. I believe that the biggest Daxx's achievement is that we have a number of clients who have been with us for over five years, and they are happy clients, too! Q: Do developers ever visit their clients’ offices in the US? Most companies prefer to invite software developers to the US at the beginning of their cooperation to successfully onboard them into the team, but this could also happen after the start of the project. Such business trips normally last between two and four weeks. We cooperate with the American Chamber of Commerce to help with visas and paperwork on the developers' side, so the entire preparation process only takes about two weeks on average. Q: What are the potential risks US companies need to be aware of when they decide to go offshore? Some companies suffer because of the loss of control over software development, hidden costs, and security issues. There are a huge number of articles on this topic. We do our best to help clients mitigate these risks by giving them full managerial control over the offshore development team, working within a fixed monthly fee so that the clients know exactly how much they are paying and what they are paying for, and signing NDA documentation with each developer. Q: To summarize, what would be your advice to US-based companies on how to successfully onboard and run a remote team? I would say that 90 percent of success lies in choosing the right developers. It's definitely important to find a reliable partner company in Ukraine, but this isn't enough. The Ukrainian tech market is huge, and Daxx helps you by pre-selecting candidates and facilitating your cooperation with them once they are hired. The most important thing is to understand that building a remote team is a responsible job, and both parties — we and our clients — have to invest their time and effort into making this relationship successful and rewarding. I'm absolutely positive that Daxx has enough experience to guide companies through this process. Find out more about our cooperation with Israeli and German companies in other interviews with our business managers.